Are you new to sewing? Have you sewn before but need a refresher course? Has Pinterest piqued your interest in trying some projects but not sure how to get started? Beginning quilters welcom. Let Mary help you at our Beginner's Circle Sewing Sessions. This will be a 'learn as you go class' and very informal. Bring your sewing machine (with manual) and basic sewing supplies such as scissors, pins, ruler and yes, the dreaded seam ripper. If you have a project in mind, bring that too, or we can help you find your needed supplies in our store. Just come early so we can set you up before class starts. 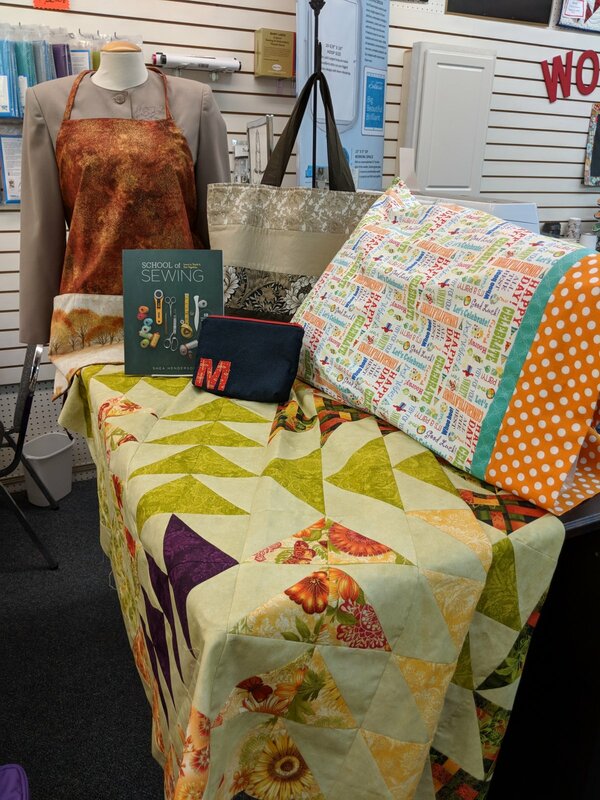 For the true beginner, Mary suggests you invest in the "School of Sewing" book by Shea Henderson which has 12 beginner projects (all the projects in the photo are in the book). It also has great tips and how to's regarding sewing supplies and fabrics and is available for purchase at Neal's. Beginners younger than 12 should be accompanied by an adult wanting to learn too.